I grew up eating this delectable dessert. My grandmother made it for religious reasons, but for me it was a yummy snack after the school every Thursday. Since I could not learn the recipe of Malpua from my granny, I asked my mother who had learnt it from my grandmother for the recipe. So here is my grand mom’s recipe – very different from the ones I have seen on the net, but I can say this how is the authentic North Indian Malpua is made. The use of fennel seeds and poppy seeds makes all the difference and makes the dish very delicious. The batter for malpua in some areas is prepared by crushing ripe bananas or (in Bangladesh) coconut, adding flour, and water or milk. The mixture is sometimes delicately seasoned with cardamoms. It is deep fried in oil, and served hot. 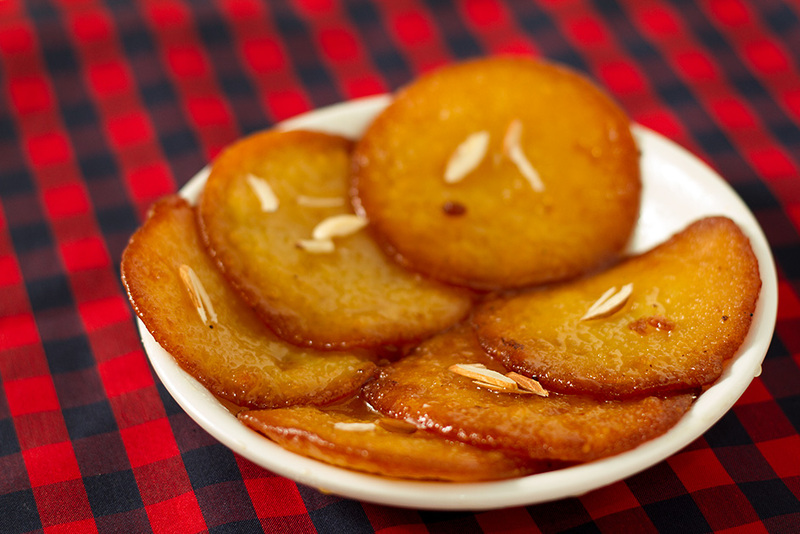 The Bihari version of this dish has sugar added to the batter prior to frying, while the method prevalent in Odisha has the fritters dipped in syrup after they are fried. Malpua in northern India, particularly in Uttar Pradesh, Bihar and Rajasthan, don’t contain fruit. There are several variations, using some or all of the following ingredients: maida (refined flour), semolina, milk, and yogurt. The batter is left to stand for a few hours before being spooned into a kadhai of hot oil to form a bubbling pancake which should be crisp around the edges. The pancakes are then immersed in a thick sugar syrup. Dissolve sugar in water (just about enough water for the sugar to dissolve) and keep aside. In a bowl mix flour, flennel seeds and poppy seeds and a pinch of salt. Add the dissolved sugar. Mix and add milk and whipped curd. Add a bit more milk if needed to make the batter of pouring consistency. Keep this batter mix on counter top for about 5-6 hours. In a deep bottomed vessel boil 1 cup water and add the remaining 1.5 cup sugar in it. Allow the mix to bubble and reduce the flame. Dip a spatula in the liquid and pick a drop of sugar syrup on your forefinger carefully to check it's thickness. Touch your finger to the thumb. The syrup is ready when it gets stuck onto your thumb with just one thread (ek taar). If the syrup is thicker, add water allow it to boil and turn off the heat. Add a pinch of cardamom powder to the sugar syrup. In a flat non stick vessel heat enough ghee to deep fry. When the ghee is heated through, reduce the flame and pour a ladle ful of batter and deep fry it. You an keep a steel ring in the pan for the malpuas to come out perfectly round. Fry the malpuas to golden brown on both sides and remove on a tissue to drain off the excess ghee. Immerse the fried malpuas in warm sugar syrup. You can serve the Malpua on it’s own or be creative and team it with Rabri, Kheer or Icecream.